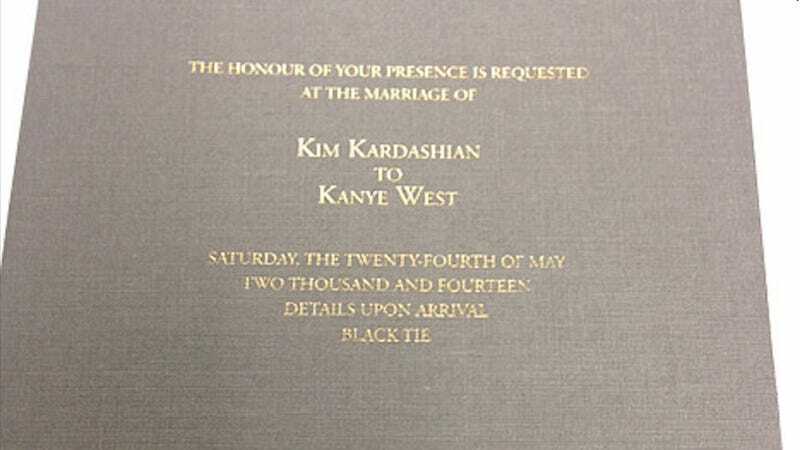 Gaze, fellow plebians, upon this tastefully understated piece of paper (probably firm in texture), embossed with an illustrious summons (golden) to the Wedding Event of the Century: THE KIMYE NUPTIALS. The photo of the invitation, which was obtained by Us Weekly, reveals a very esoteric document indeed. Some things to note: in addition to being golden, the word "honor" is spelled with a "u", which is really just decadent; the paper is brown, which is a risky choice; the pre-wedding dinner is in Paris, but who knows where the wedding will take place (my best guess: also Paris). According to famed astrologer Susan Miller, Saturn and Jupiter will collaborate in a rare aspect on May 24. The stars smile upon this union.